With its classic blue rose print on a classic white background, the Nelly Blue bedding collection brings a touch of shabby chic to your bedroom. The timeless look of this collection is sure to be a crowd pleaser. Reverse the quilt to a pretty blue and white ticking stripe pattern for additional styling options. The European sham and bedskirt of this collection are also done in the ticking stripe pattern, and beautifully offset the floral of the shams and quilt. These items are 100% cotton, and machine washable for easy care. Made by C&F Enterprises. Add a touch of shabby chic style to your bedroom with the Nelly Blue Quilt Set. 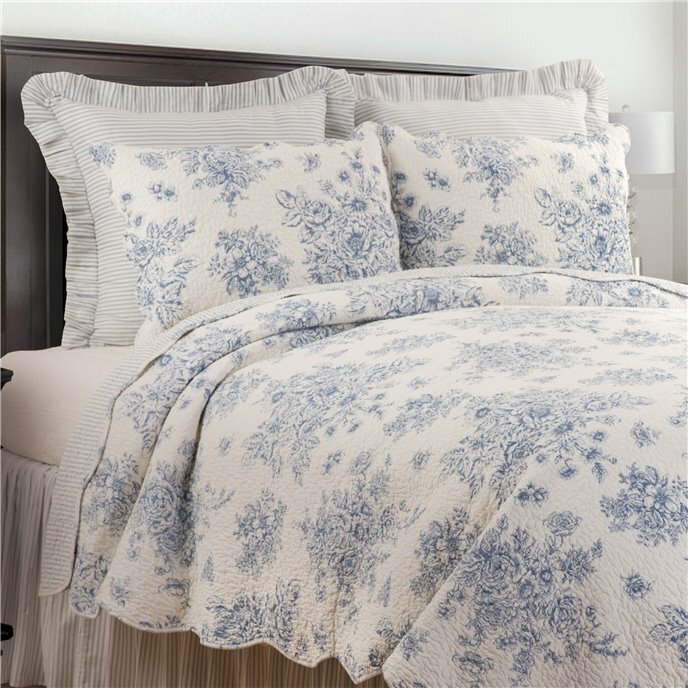 With a blue on white vintage rose print, this stylish bedding creates a timeless look. Reverse to a blue and white ticking pattern for additional styling options. Crafted of cotton, this bedding set includes a quilt and coordinating standard sham(s). 1 Twin Quilt and 1 Standard Sham, Measurements: Quilt 64" x 86"; Sham 20" x 26", Hand Guided Vermicelli Stitching, Coordinating Accent Pillows, Euro Shams and Bed Skirt Available Separately, Cotton, Fill Material Cotton, Machine Wash Cold, Line Dry, Imported. Made by C&F Enterprises. Add a touch of shabby chic style to your bedroom with the Nelly Blue Quilt Set. With a blue on white vintage rose print, this stylish bedding creates a timeless look. Reverse to a blue and white ticking pattern for additional styling options. Crafted of cotton, this bedding set includes a quilt and coordinating standard sham(s). 1 F/Q Quilt and 2 Standard Shams, Measurements: Quilt 90" x 92"; Sham 20" x 26" , Hand Guided Vermicelli Stitching, Coordinating Accent Pillows, Euro Shams and Bed Skirt Available Separately, Cotton, Fill Material Cotton, Machine Wash Cold, Line Dry, Imported. Made by C&F Enterprises.